Talk & Listen Metal Talk Buds - Control Your Phone/MP3 Player & Take Calls See the video! - SHIPS FREE! 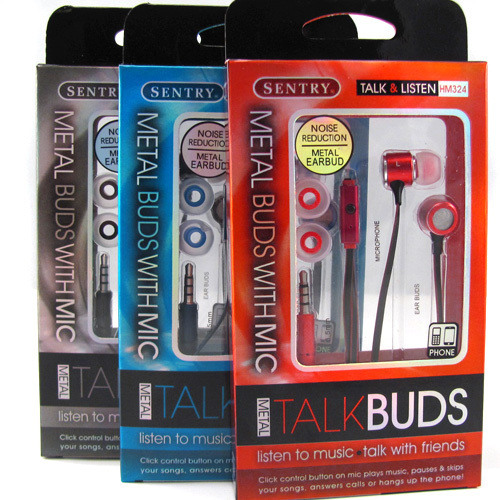 Sentry Talk & Listen Metal Talk Buds - Control Your Phone/MP3 Player & Take Calls SHIPS FREE! You will receive 1 of 3 colors: Red, Blue, or Black. If you prefer a certain color, please indicate in your order comments and we will do our best! Take your calls on the run with these great Ear Buds w/ built-in microphones and control button. Use the control button to start your music, pause and skip songs and even answer and hang up phone calls without ever removing these sweet buds from your ears!